Preheat oven to 350°. Process cookies in food processor until fully crumbled. Add coconut oil and pulse until well combined, then spread the mixture evenly among the tart shells, making sure to push some up the sides as well. It should be nice and thick! Place tarts shells on a baking sheet, then bake for about 8 minutes. Set aside to cool. In a saucepan over medium heat, combine pumpkin, both sugars, spices, and salt, and cook for about 5 minutes until thick and smooth. Remove from heat, and add coconut milk and eggs, whisking until fully incorporated. Allow mixture to cool for a few minutes. 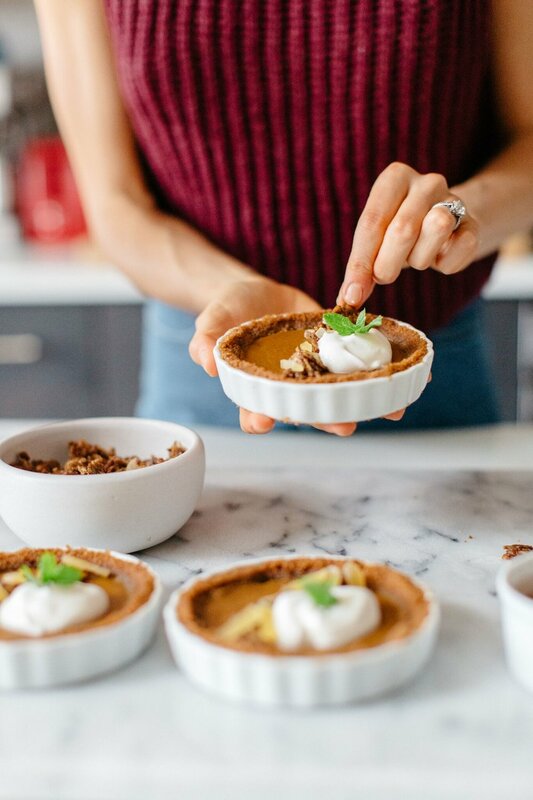 Pour pumpkin mixture into prepared tart shells. Bake at 350° for about 25-30 minutes or until a toothpick inserted into the center comes out clean. Remove from baking sheet and cool completely on wire rack. Top with candied pepitas and ginger, and serve with whipped cream. Enjoy immediately or chilled. *To make this dairy-free, sub coconut oil for the butter in the crust, and serve with whipped coconut cream. All photos by Kristen Kilpatrick for Camille Styles. Check out the feature and recipe on her site as well! There are so many things I love about summer. The sunshine, beach getaways, and carefree attitudes are all great, but one of my favorite things about late summer in particular is stone fruit. Plums, peaches, apricots, and more are all at their peak ripeness at this time, and you can find them all over the farmers market here in NYC. While they taste super sweet and juicy all on their own, stone fruits can lend themselves to a seriously delicious dessert as well. I love halving them (to show off their beautiful colors) and baking them up in a tasty, yet simple tart. I've used some nice hearty plums here, but feel free to substitute whichever stone fruit you please! Marinate the plums in the Cointreau with 2 tbsp sugar for at least two hours, preferably overnight. For the pastry, mix the butter into the flour in a mixing bowl with your hands (or use a food processor) until it's a course, crumbly mixture. Add the egg yolk, sugar, and salt, and mix until the dough comes together into a ball. Add a bit of iced water if the dough seems to dry and crumbly. Wrap it in plastic wrap, and chill for at least one hour. You can make this ahead of time, or if you're in a hurry, use a store-bought pastry dough. Coarsely grate the pastry into a 9-inch tart shell, and spread it out with your fingers. This method gives the pastry a rustic, flaky texture. Chill the prepared tart shell for 30 minutes. Preheat oven to 350 F, and prick the tart's base with a fork. Cover with parchment paper, weigh it down with dried beans, and par-bake for 15 minutes. Whisk butter and 1/2 cup sugar until light and fluffy. Add egg, vanilla, and any juices from the plums until mixture is well combined. Stir in almond meal and flour, careful not to over-mix. Pour this into tart shell and push plums in, cut-side up. Reduce temperature to 300 F, and bake for about 1 hour. Cover with foil if edges start to brown too quickly. Allow to cool, then serve with whipped cream or ice cream, if desired. Preheat oven to 350 F. Combine graham crackers, brown sugar, and salt in a food processor, and pulse until combined. Pour in coconut oil, and pulse a few more times until mixture is uniformly crumbly and moist. Press crust mix into the bottom and up the sides of a standard 9-inch pie dish. Bake crust until lightly browned, about 10 minutes. Set on cooling rack while you prepare filling. Zest limes into the bottom of a medium bowl until you have 2 tablespoons (reserving a bit for topping). Beat zest and egg yolks in a stand mixer (or use an electric hand-held one) until pale and thick, about 5 minutes. Add sweetened condensed milk and beat until well incorporated, about 3 minutes more. Whisk lime juice into yolk mixture until combined. Pour into graham crust and bake pie for another 10-12 minutes, until center is just set. 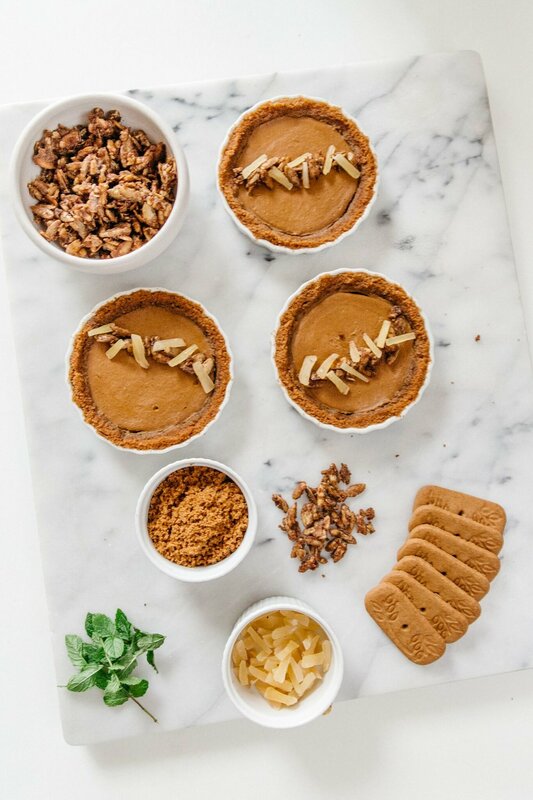 Let pie cool completely before adding topping. In a medium bowl of stand mixer, beat cream and sugar until soft peaks are formed. Spread over top of chilled pie. Sprinkle with toasted coconut and extra lime zest. If possbile, chill pie for another 2-3 hours so that topping can fully set. Slice and enjoy! Pie will stay fresh in the fridge for 5-7 days. *Adapted from key lime pie by Smitten Kitchen. I wanted to bake a festive dessert for our holiday dinner this year, but one that would also please most everyone at the table. 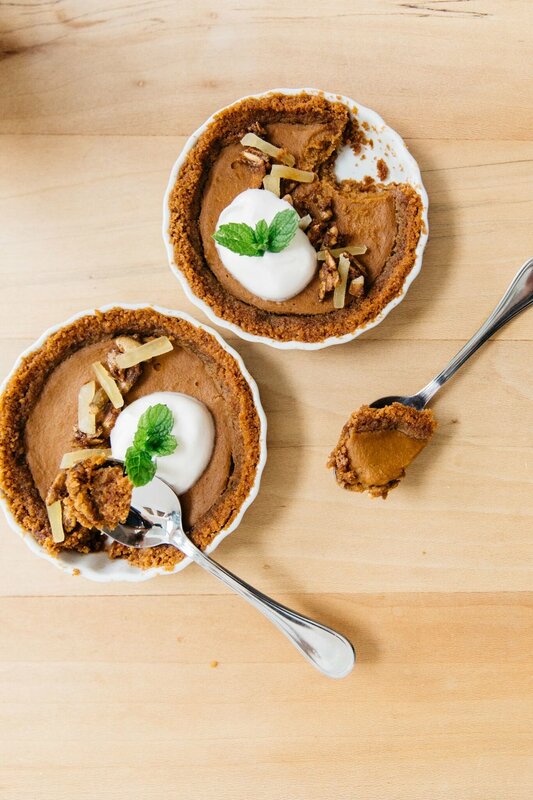 Chocolate naturally came to mind, and this gingersnap chocolate cream pie with bourbon pecan crumble by Kale & Caramel was a true winner. Even better, it's all vegan, and most of my family couldn't even tell! The crust is made from gingersnaps and coconut oil, while the chocolate cream filling is thickened with chia seeds. And those candied bourbon pecans? Make extra because you'll want to put them on everything! A decadent pie that you can feel good about indulging in- what could be better?! Head on over to Lily's site for the recipe.